The Arunachal Budget-2018 presented by the Deputy Chief Minister Chowna Mein is in line with the philosophy of sabka saath, sabka vikas, said of BJP State President Tapir Gao. Gao congratulated Chief Minister Pema Khandu and Deputy Chief Minister Chowna Mein for yet another landmark budget that will bring about all round development in the State. The budget is a very progressive, people oriented budget, BJP Arunachal Pradesh said that it fully endorses the progressive pro poor, pro-people budget, Said Mr Gao. While hailing the budget presented by Pema Khandu led government, Gao termed the budget document as testimony to the party and government’s commitment to a bright future, with firm resolve to carry forward our rich tradition and culture. He opined that the 8 thrust areas of education, skill development, health, governance reform, IT, Infrastructure, social security, agriculture and allied sectors are very important areas that will spur developmental activities and boost economic growth. 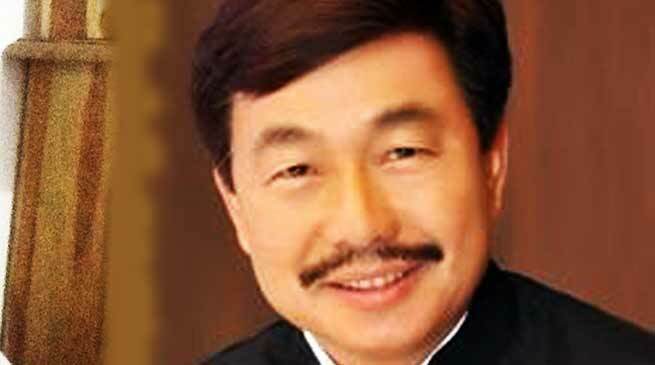 “Total budget outlay is a new benchmark in Arunachal Pradesh’s history,” said Gao while referring to fund of Rs. Rs.19261 crores spread across 16 sectors/ subjects as announced by Deputy CM & Finance Minister Chowna Mein. Arunachal Pradesh is primarily an agrarian state where more than 80 percent of the people still depend on agriculture for livelihood. Therefore, focus on agriculture entrepreneurship, farm credit facility, agriculture extension service, marketing facility and better planting materials are need of the hour which will go a long way in growth in the agriculture sector, thereby, augmenting the livelihood of thousands of farmers. Proposal for creation of Krishi Mitras in each district proposed in the budget is indeed an innovative way of improving agricultural service deliveries that will benefit innumerable farmers. In order to improve delivery of healthcare of services, creation of robust, transparent and accountable system of procurement of medicines and equipments was important besides recruitment of more doctors and other medical staffs. This felt need of the people has been addressed by the budget by proposing to create District Health Society for transparent and accountable system of medical procurement which will greatly enhance pace of procurement and quality of equipment and medicines benefiting hundreds of patients. Another remarkable provision of the budget is announcement of Rs. 10 lakh financial assistance to renal failure patients. Every year several patients undergo renal failure treatment and this provision of the budget will of tremendous help to patients coming from humble backgrounds. Welfare and security of women folk is of prime concern of the Bharatiya Janata Party (BJP). Keeping in line with this philosophy of the Party, the budget has proposed several initiatives for women empowerment that include strengthening of Arunachal Pradesh Women Commission and establishment of more women police stations besides announcement of several incentives for the benefit of the women. Focus on skill development and entrepreneurship through Chief Minister’s Yuva Kaushal Yojana will lead to capacity building of hundreds of youth who are looking for alternative employment apart from government job. This is yet another very progressive proposal in the budget for the welfare of the youth of the State. Gao expressed that several provisions in the budget have been designed taking into consideration specific challenges faced by the youth which is highly commendable. Much needed policy and governance reforms have been initiated that would herald effective, efficient, empowered and transformative new Arunachal, added Gao.